Sorry for the delay, dear readers, in announcing the winner of the great ciabatta bake off. Life had kind of gotten on top of us here at the Global HQ of Virtuousbread. Now, we are back and raring to go, write, bake, do the new cook book and maybe rest a bit in the summer! All that for the future and for now...drum roll...the winner of the ciabatta bake off. 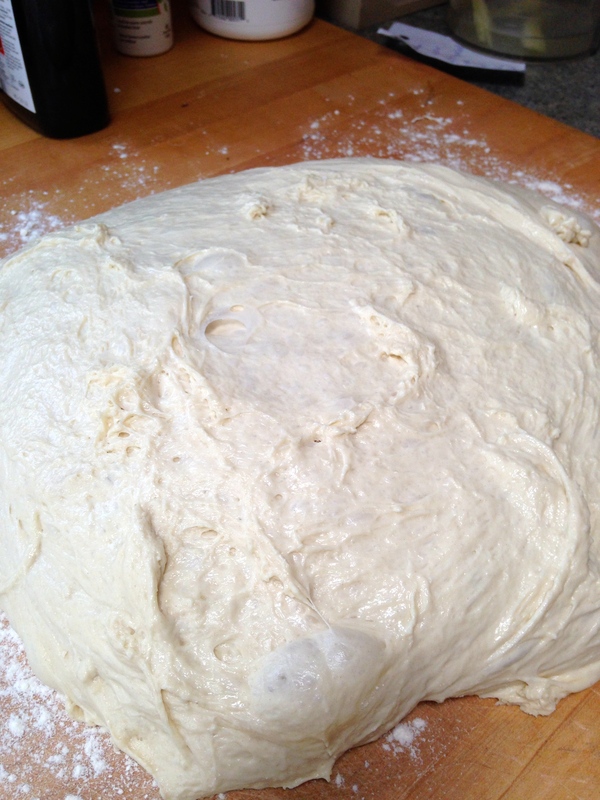 12 - 24 hours before you want to bake, mix up the ingredients for the biga. If you are using dry active yeast, measure the water into a big bowl and measure in the yeast. 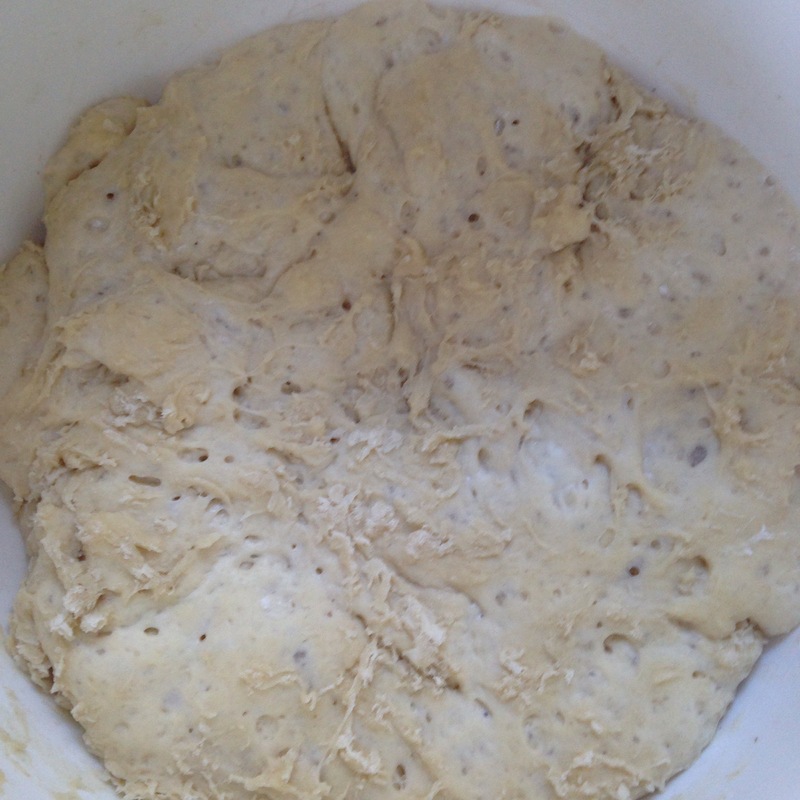 Let it sit for 15 minutes for the yeast to dissolve and then add the flour and the salt. Stir it up and cover it with cling film until you want to use it. If you are using instant or fresh yeast, simply measure everything into a big bowl and stir it up. Cover until you want to use it. Measure out the water and pour it over the biga. 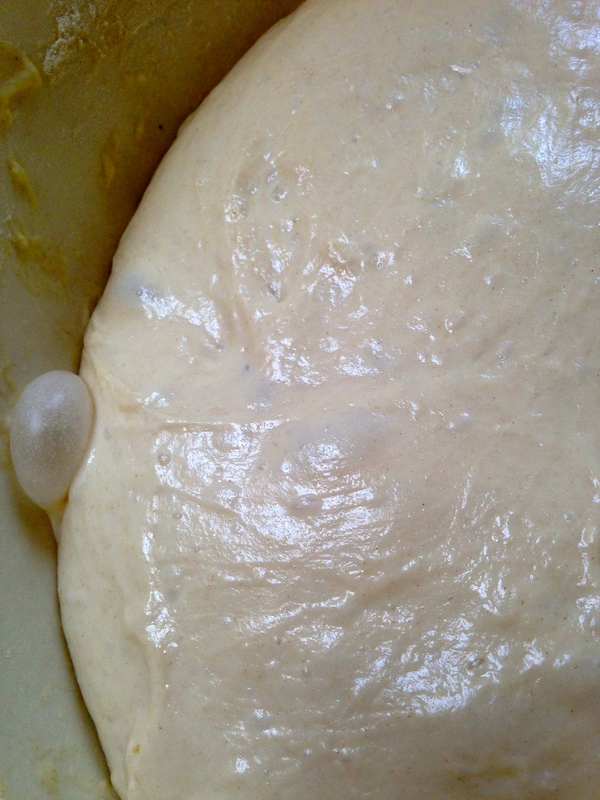 Add the yeast and let it sit for 15 minutes. Then, squish everything together with your hands to form a milky paste. Add the flour and the salt. Mix everything up with your hands for a minute or two until it is blended and you cannot feel any big lumps of flour. Cover with cling film or a shower hat and let rest for 30 minutes. Using a scraper and/or very floury hands, get under the dough at the edges and gently stretch it out into a square. Just tug at the edges because you don't want the dough any thinner, you just want it more regular in shape. Cut a "+ " into the the dough to get 4 smaller squares, rather than cutting it into four strips. Move them apart from each other on to separate floury islands as you cut them. The dough is going to stick to the scraper so you may want to flour the scraper and use another scraper to scrape the dough off the first one. Avoid flouring the top of the dough. - with floury hands, pick up the top edge, stretch it out gently and fold it into the middle of the square and gently lay it down. Don't press on it. Repeat with the other three pieces of dough. Place two pieces on one half of each of the towels and then fold the towels over to cover the dough. Let it rest for 30-45 minutes until it is visibly airier. 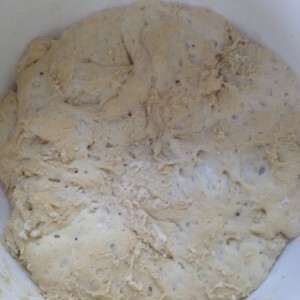 Bake the dough for around 20 minutes. When you tap the bottom of the bread it will sound hollow. If you have a probe thermometer the inside temperature will be 98 degrees celsius when the bread is done. Remove from the tray and allow to cool completely on a wire rack. Don't cut it open until it's cool or you will not see a perfect crumb. Bread is still baking as it cools and if you cut it too early it's still a bit gummy. Exclaim in delight! Want to learn more? 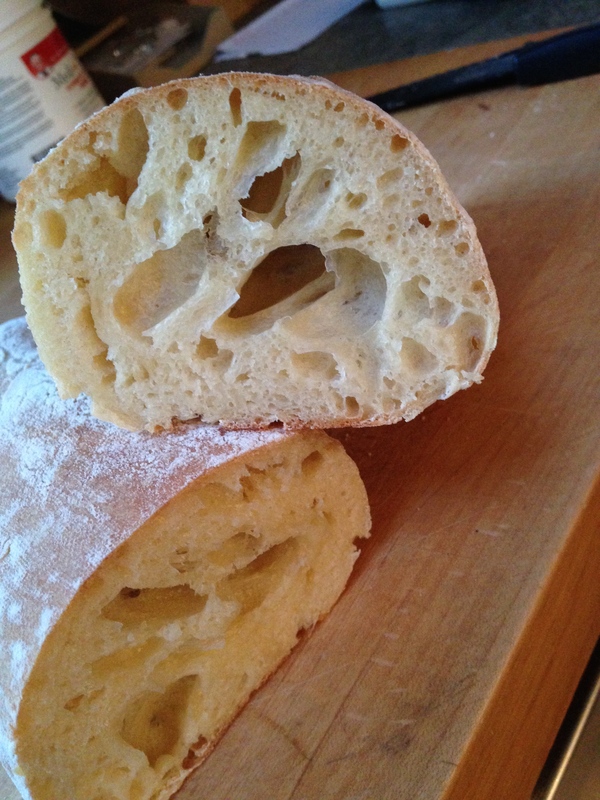 We frequently run an Italian bread course - click here to book a course today! Jane - what kind of flour did use use - ordinary strong, 00 or combo? Hey Doll, I just used a strong bread flour. 00 is not an indication of strength (see here: http://www.virtuousbread.com/bread-and-conversation/what-is-italian-00-flour/) so you can have a strong 00 or a weak 00. Pasta is made from strong (durum) 00 whereas most bread in Italy is made with plain flour 00 because all the strong flour goes for pasta! 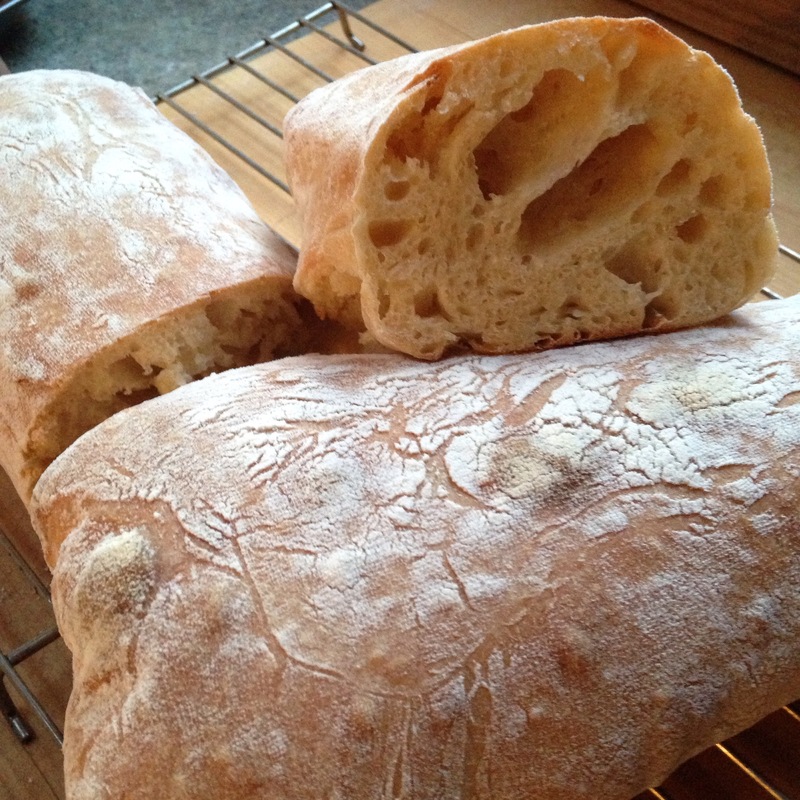 If you want a really authentic ciabatta you must buy Italian flour for bread. It will be 00 and it will probably not be durum. Italian flour has more enzymes than English flour. All else being equal, more enzymes = more holes, bigger holes, more easily. How interesting! I've watched "The Italian Grandma" series on YouTube, and her bread dough is so wet, it's like a huge puddle in her giant bowl. She pulls it up and cuts off great big pieces with her kitchen shears. I can't imagine how it stays in shape (free-form), but it does. She makes loaves, buns, flat bread, and pizza, all from the same dough. 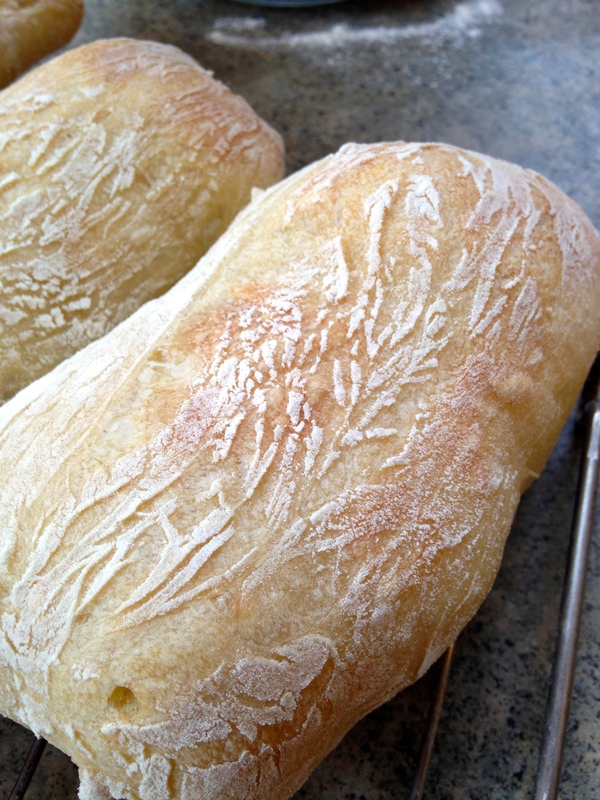 My Italian grandmother in law taught me how to make 5 loaves of Italian bread at a time, but hers wasn't that wet. Thank you again for your great site!